Accommodation: Volunteers will sleep in tents at the farm campsite. Project Details: 40-50 children between the ages 10 to 16 will be invited to visit the land on a daily bases to experience the rural setting and take part in fun, educational and creative projects. Volunteers will lead small groups of children in different activities, as well as running games and sports for the whole camp. 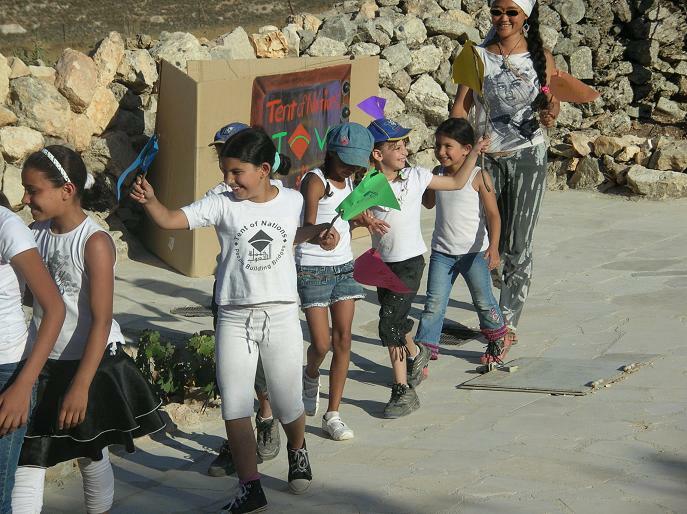 The camp will culminate in a performance of theatre, dance and songs that the children have practiced during the camp to celebrate in a final-day festival with the children’s families. Volunteers will also get the chance to learn for themselves about the Tent of Nations story, and about the wider political situation in Palestine, and have the opportunity to visit other areas of the West Bank. Weather (July): The weather is mostly hot, dry and dusty, with temperatures between 25º-30º. On the vineyard it is usually hot during the day, but can get chilly in the evening.